Addi & I love to cook together, and I like to cook healthy dishes I know (or hope) she will enjoy eating. Here is a recipe for a healthy, veggie-packed, 1-dish meal that's fun for little helpers & tasty for young & older taste buds alike! Addi washed the veggies and helped stir the tomato sauce (sorry, no pics), then I grated the zucchini. 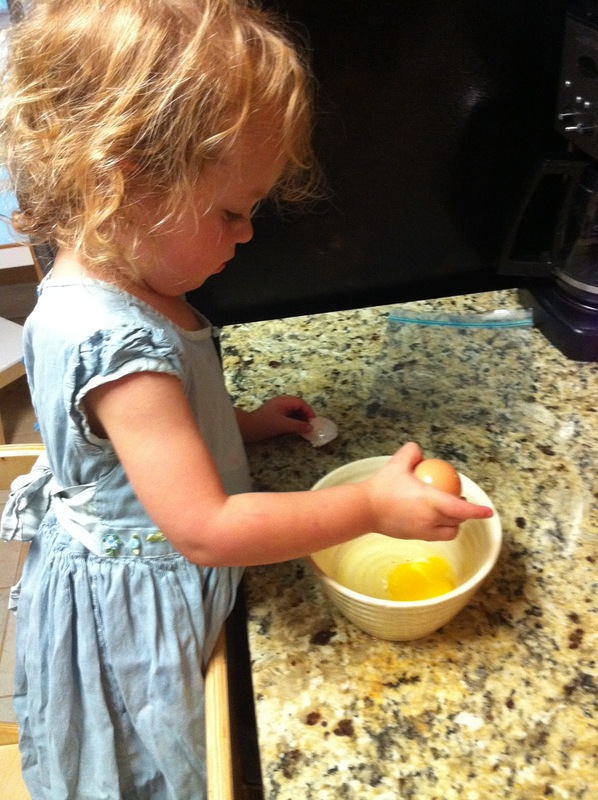 Meanwhile, Addi prepared the eggs. Note: some kids are able to grate veggies, but my daughter has not shown much interest, especially once she sees there are eggs ready to break & stir! Caution: check the oven for objects before preheating! Our home is on the market and I've been known to stash stuff in there when there's no time to clean up and I have to leave. Unfortuantely I didn't discover this bowl and spoon until I went to put the food in to bake..ack! It was surprisingly easy to clean up...much easier than the lasagna my dear friend Cathy dumped in our oven one time! In a small sauce pan combine first 7 ingredients (tomato paste through salt). Bring to a boil then let simmer for 15 minutes, stirring occasionally. In a separate bowl combine next 5 ingredients (turkey through mushrooms) & 1/2 cup of the tomato mixture. Mix well. Shape into loaves & place into an ungreased loaf pan. My loaf pans are packed away, so I just used tinfoil in a long glass pan. Note: some parents will definitely let their kids combine the meat & veggies into a loaf, but I chose to do that part myself...I'm a bit squeamish about touching raw meat, so I haven't yet let Addi. Discard drippings, then pour 1/2 of remaining tomato mixture over the top of the loaf. Then place on serving platter, cool for 10 minutes, slice & serve with remaining tomato sauce. Note: Addi couldn't wait to eat until her Dad came home, but she had another full serving with him! I made these in a muffin tin for dinner tonight, it worked great.